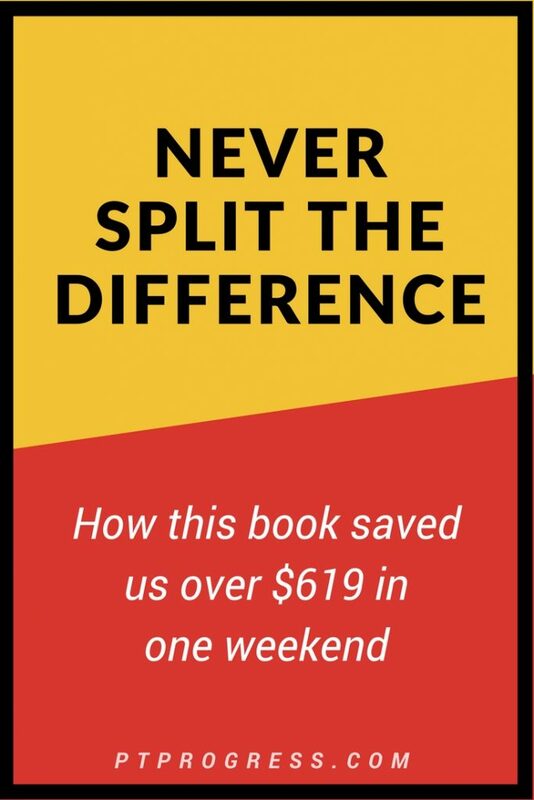 This week I just finished the book “Never Split the Difference” by Chris Voss. It is absolutely one of the best books on negotiating that I’ve ever read. So when my friend texted me about going out this weekend to buy a car, I thought it would be the perfect opportunity to put to work the new ideas I had learned from my new favorite negotiations book. Besides, I’m the odd type of person who actually enjoys negotiating at a car dealership, but haven’t needed to buy a car for the past 2 years, so I was up for the challenge. Found the Perfect Car, Now What? The search for his car began online. He was looking at a few cars 3 to 4 years old with around 40-60,000 miles. But when a 6 year-old car with only 36,000 miles popped up, I knew we had a deal on our hands. It was priced right – literally the lowest priced Honda Pilot in the country for the miles. It looked great and was an hour away – talk about fate. But don’t get ahead of yourself. You must not fall in love with the car or the deal if you want to come ahead at the end. The car was priced at $20,000 on the nose – extremely reasonable and already 2k below the KBB and other comp sites. Here’s the sales guy already trying to pull the scarcity frame on me. I hate to generalize about car salesmen, but this one fit the bill. Knew everything about all things. Quick to turn the conversation his way. So I let him talk. One of Chris Voss’ negotiation strategies is to use a “no” question at the start. I implanted a No question right out the gate. When you draw a “no” from the other person, it gives him a sense of control and preserves their sense of autonomy. It also puts them in a position to share why they said no (if you let them talk). Our initial phone call was full of awkward silence. Oh don’t worry, I can hold a conversation just fine. It’s just that he was giving away so much gold when he kept rambling about making the sale happen. So I just kept silent. Note that I haven’t given a price. I’m waiting for him to negotiate against himself. Out the Door: In Michigan we have a 6% sales tax and have the option to pay it all (including tags/registration) at a dealer. When I said “out the door” I was subtly bundling everything together, essentially asking him to lower the price by about $1700. After taxes, plates, and fees the $20,000 vehicle would actual cost about $21,700. Sales Guy: “Are you kidding me? This is the lowest priced Honda Pilot in 600 miles! He was right and I knew he was right. But even though the price was superb, I needed to get the best deal possible. My friend was paying cash and saving even $200 makes a difference when you’re counting the hundreds on the table. BOOM! I snuck in the calibrated question. In his book, Chris talks about the most powerful calibrated question out there: “How am I supposed to do that?” It’s an open-ended question and it is designed to make a shift in the mindset of the person with whom you’re speaking. As Voss describes, using the question, “how am I supposed to do that?” will catch the other person off guard and hopefully influence them emotionally. Suddenly they are drawn by a request to actually help you find a solution. BOOM! Time for some mirroring. I’m seriously not making this story up. The conversation felt surreal because I seriously had the pages of Voss’ book open and my notes right in front of me. At this stage I wasn’t sure how I wanted to answer him, so I mirrored him. A technique Voss teaches his students to use to try to draw out more from the person. It’s not really a question. It’s literally repeating a word or phrase back to the other person and then being silent. So I tried it. I repeated the line back to him and was silent until he couldn’t take the silence. Me: “So there is a little room then? It seems like you’re suggesting there would be a few hundred dollars off if we financed with the dealership? At this point he was caught in his words. He was adamant that the price was set at $20,000 and didn’t want to negotiate over the phone. But after just 15 minutes of listening to him ramble, he hinted at the possibility of a lower price – and I didn’t have to make any request. Getting them to negotiate against themselves is a tool that Voss highlights in his book. Through some mirroring and silence, he ended up talking himself down a few hundred dollars. Here was a guy who said he “never negotiated price on the phone,” and ended the conversation acknowledging that he could lower the price by $300 if I were to show up in the morning. I knew we had some room to negotiate. If he could lower the price by $300 for those who financed with him, he could lower it by $300 for someone with cash in hand. Me: “I want you to know that I am serious and want to be able to discuss the price more with you tomorrow AM. I should be there around 9AM. I arrived with my friend and a box of donuts thanking him for meeting with us this morning. The car was pulled around the front but the detailers hadn’t washed it yet. Why the donuts? It was a $3 gift that would hopefully foster sense of reciprocity that may favor me later that day. I fully acknowledge that it seems cheesy and had no clue if it would work. But it was $3 and I wanted to try something completely different. While he put the donuts in his office, we walked around the car. It was in excellent shape. We walked back to our car as the detailer drove it to the back and when the sales rep waved for us to come inside, I gave him the finger. We were sitting in our car where we wanted to be. We would discuss the car with him once it came back from being washed. Our goal was to control the frame here. We would talk with him when we were ready to talk. It would be on our terms. We weren’t about to wait in his cramped office for 15 minutes giving him the opportunity to repay our gift of donuts with some painful pleasantries and sales tactics. After about 20 minutes, the car was returned and it was time for the test drive. The sales rep handed us the keys and waited for us to return. It was perfect. Great shape, smooth ride, and everything he wanted. Now it was time to talk turkey. I knew he was already able to go down $300 before we even started the true ‘negotiation’. He led with the offer to reduce the price by $300 but that was the absolute lowest. No question. “How am I supposed to do that?” I would reply as a way to draw an awkward silence enough for him to muster up an answer to my sincere concern. I must have said it 6 times throughout the conversation. I said it to him as well as to myself as I looked at the calculator on my phone, trying to figure out how I could make his offer work with the price that I wanted to pay. Slowing down the conversation was pretty easy to do. Between asking, “how am I supposed to do that”, mirroring him, and working intensely on my phone’s calculator, I was keeping the pace of the negotiations where I wanted it. My goal here wasn’t to play a game of negotiation tennis until we met in the middle. I mean, the book’s title is Never Split the Difference, so I wanted to take a different approach. I offered my “out the door” price of $20,561 or about $19,100 without taxes. ($900 lower than the sticker). My original ‘anchor’ was an out the door price of $20,000, so I was making a significant jump here. You might argue that I could or should have held out a little longer, but that’s the decision we made at the time. Why such an odd out the door price of $20,561. – It was an attempt to relay that I had a figure in mind and needed to stick to it. – It ended in an odd number, a strategy that Voss highlights in the book. When the sales representative returned, he came back with some reinforcements. His manager sat down and reinforced the $19,700 sticker price was a great price for the car and proceeded to pull up all the other Honda Pilots in the country. None priced even close to the one in his lot. He was right, but I needed to pull more out of them. I made it a point to reference my phone a lot as to use the calculator. But if I’m honest with you, I spent just as much time looking through the list of calibrated questions and frames that I wanted to mix into the conversation. The night before I had typed 4-5 calibrated questions and framing statements that I could reference during our negotiations. Sounds crazy. I know. I’ve never referenced preemptive questions in a negotiation before. But again, I was just following a few of the recommendations from the book. He dropped the price by another $200. I knew we had him. This car was already priced right at $20,000 and coming down $500 may not seem like much of a win, but it was. My friend was happy with paying $20,000. He knew the car was worth much more, and he was thrilled to see one available at that price with so few miles. But we weren’t done negotiating yet. The car needs new wiper blades all around. There is no gas in the car, could you fill it? The leather needs to be cleaned in the back. The sale price of the car ended up at $19,476 because I insisted the out the door price finish at an even $21,000 with taxes, plates, and registration. The $24 difference was enough for him to end the awkward silence and agree to the sale which included filling the gas tank and putting on new wiper blades. The non-monetary items really did add up in our favor. The gas in the tank was at least $50 and 3 new wiper blades were easily $45 – that’s $95 my friend kept in his pocket that afternoon. The net price of the Honda Pilot including the gas and new wipers totaled $19,381, a cool $619 below the asking price. As we left, the manager let us know that the service team replaced all the wipers, filled it with gas and even performed a fresh oil change on it. I hadn’t asked for an oil change and frankly forgot to add it to the list of ‘add-ons’ in my negotiations. Maybe the donuts paid off after all. If you’re interested in becoming better at negotiations, you should read the book Never Split the Difference by Chris Voss.